I ordered two singles with cheddar, tomato, mustard, sirachi & egg. Burgers were tasty however, the attitude of the cook has soured my experience. The burgers themselves were cooked well done. I asked for medium and the cook said no, all were cooked well done. I also asked about having my egg cooked sunny side up instead of fried hard. That request was also denied. I am not sure at this time if I would order again from that truck or not. Like 5 Guys, Dorothy Moon cooks burgers well done, so go elsewhere if you need fresh blood. Also like 5 Guys, a very good burger. My coworker and I walked by a this truck during our lunch break. It smelled amazing but we kept walking to check out the other trucks. Out of the 15 we saw we came back to this one to try it out. Glad we did. I had a single with cheese along with lots of toppings. Only cost $6 which was worth every penny. Highly recommend this food truck. 2. meat is not seasoned at all...not even basic salt & pepper. MacDonald's use basic seasoning. 3. double is too large to bite...maybe good for a lion's mouth. It rises back up after pressing it down with my hand. 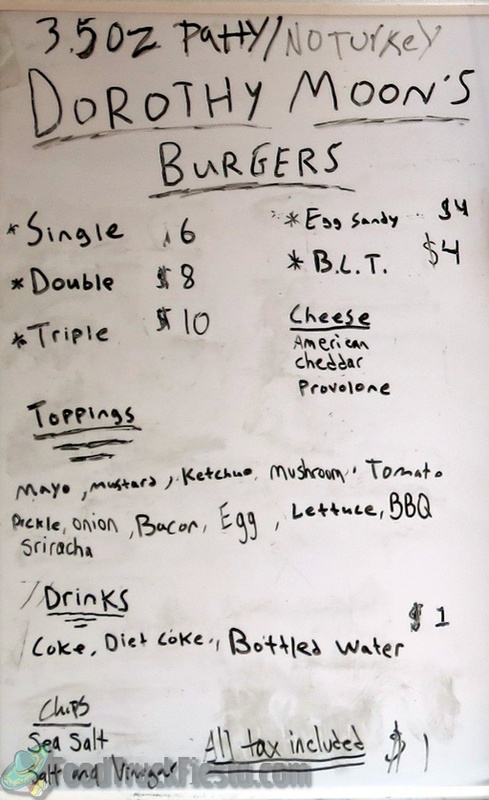 I tried a burger from DOrothy Moon for the first time yesterday and was highly disappointed especially after reading through some of the more favorable reviews. First, in just a couple of days from when the menu photo was taken, they've gone up to $7 for a single, I ordered a single w/cheddar, bacon, and bbq. Very bland meat. Needs seasoning and very small I might add. I am not a huge fan of 5Guys but they win this round for certain. Service was failry quick but won't waste 7 bucks again. Okay. i thought i would give this a shot since some reviews gave it such high marks. I ordered the single/cheddar/bacon/bbq. Umm, the price sign was taken on 11/13, I went on 11/15 and the single was $7. Hmm-does the price go up in DC? Anyway, I wasn't at all impressed with the burger. When I got my bag it felt light as a feather but sure enough there was a burger inside. I am not a fan of 5 guys, but unfortunately I have to give Moon a thumbs down. For the price - very small, flavor somewhat bland - meat needs seasoning. But the bacon was great. I was excited to finally try this place but overall my rating is 'meh'. The burger was fine. It wasn't anything special and I wish I'd known how thin the patties were before ordering. I was mostly disappointed because after getting back to my office to eat it, I discovered the bacon had not been put on my burger. It wasn't worth it to trek back out there. Great Burger! Better than Five Guys! Good burger, but a bit pricey. Worth the price if you get a LOT of toppings. Tastes just like Five Guys. Not impressed!!! Not gourmet by any means. The meat did not taste gourmet. With all the fancy burger places in the city I thought this would be a real gourmet burger. Please take notes from Bobbys Burger Place, Good Stuff,Shake Shack, BTS and Rays Hell Burger. Even matchbox has a burger better then than Dorthys. Save your money and go to Five Guys. 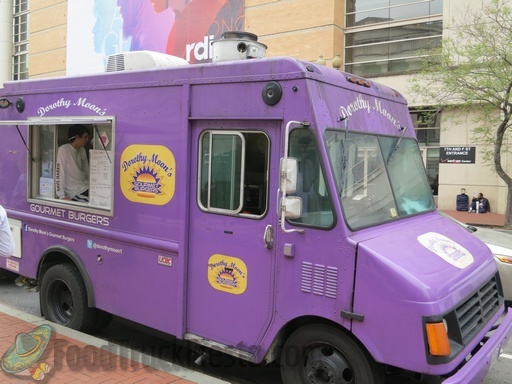 Dorothy Moon’s Gourmet Burgers food truck is operated by two guys and started serving on December 2, 2011! They now offer a triple patty burger and will even put an egg on top!